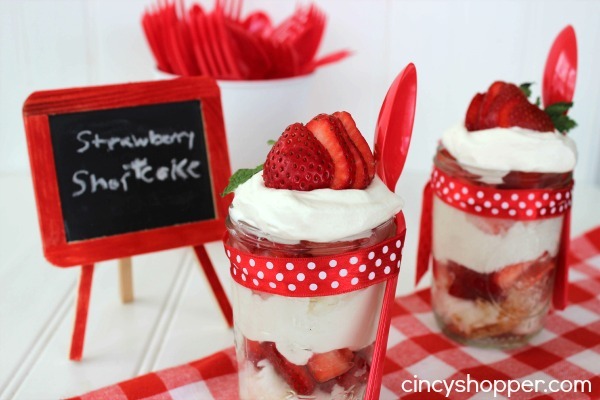 It’s officially picnic season and this Strawberry Shortcake in a Jar Recipe will be great for serving up at your next grill out. We decided to make these today to see how well they would work for our July 4th get together. We have officially decided that we are grilling out this evening since the sun has decided to shine today. I must say they are PERFECT. Strawberry shortcake is one of my favorite desserts. My kiddos have loved our Strawberry Shortcake Sugar Cookie Cups (I have had to make them 2X now, ha ha) and also the Strawberry Shortcake Popsicles I made for them.. 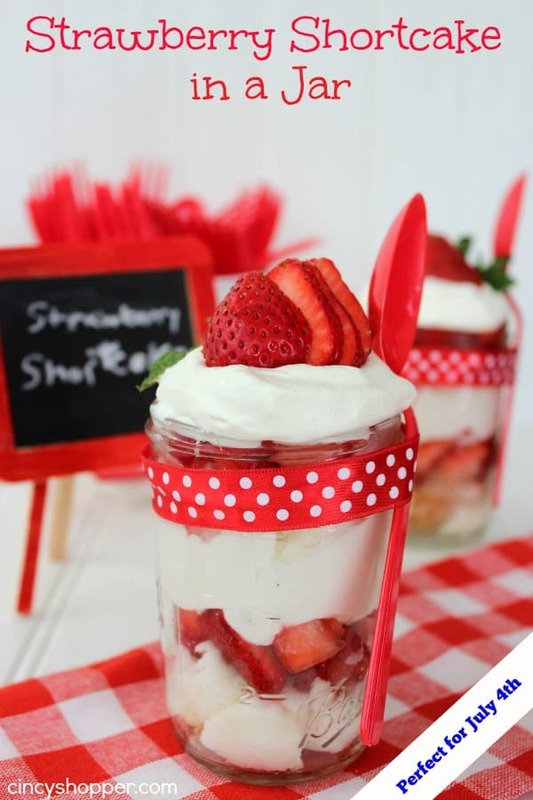 So I am thinking they are going to LOVE these Strawberry Shortcake in a Jars for dessert this evening after our grill out. Having great looking desserts is always a MUST when we have grill outs. Doesn’t everyone look forward to the yummy summer desserts? I know we always do. I tend to make most of my desserts loaded up with fruit and whipped cream. All the berries just “scream” summer goodness. Desserts in a jar are always my favorite. You can sort of make them all ahead of time. So easy for everyone to grab and eat right from the jar itself. They are always a hit. You can even tie on some ribbon to coordinate and even attatch your spoons right to your jars. 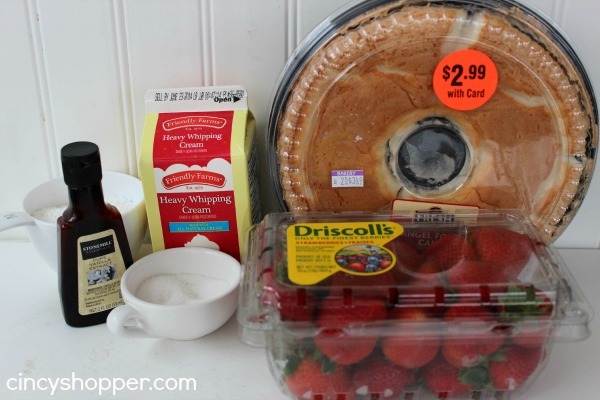 Just grab a store bought Angel Food or Pound cake cubed up and tossed in with some strawberries. I like adding on the homemade whipped cream as it tends to last longer in the heat. Reserve 4 strawberries for garnish. 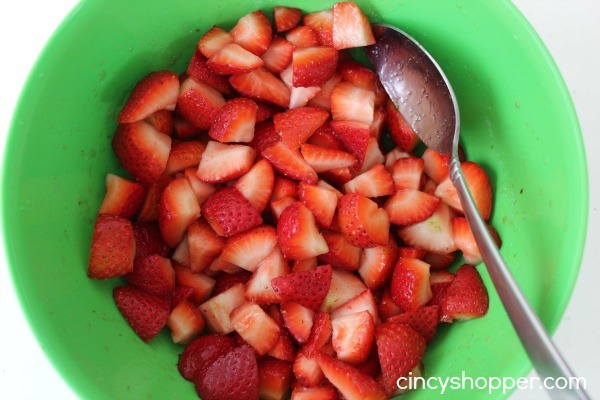 Remove stems and cut remaining strawberries up and put in medium bowl. Sprinkle with sugar and allow to sit for at least 30 minutes. Cut cake into 1″ cubes. Combine heavy cream, powdered sugar and vanilla. Whip until stiff peaks form. Transfer to zippered bag and place in freezer for 15 minutes. Clip corner of bag to allow for piping. In each jar layer cake, then strawberries, then whip cream and then repeat these layers. Take reserved strawberries and use for garnish on each jar. 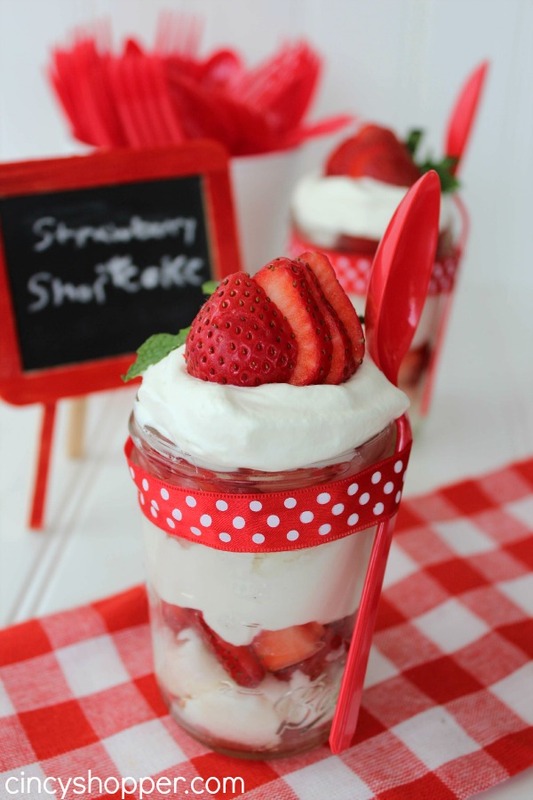 Making this Strawberry Shortcake in a Jar Recipe is so simple. I know it is going to be great when we are pressed for time this summer (I think that is always, ha ha!). I have been whipping up quite a few picnic (grill out) desserts lately. 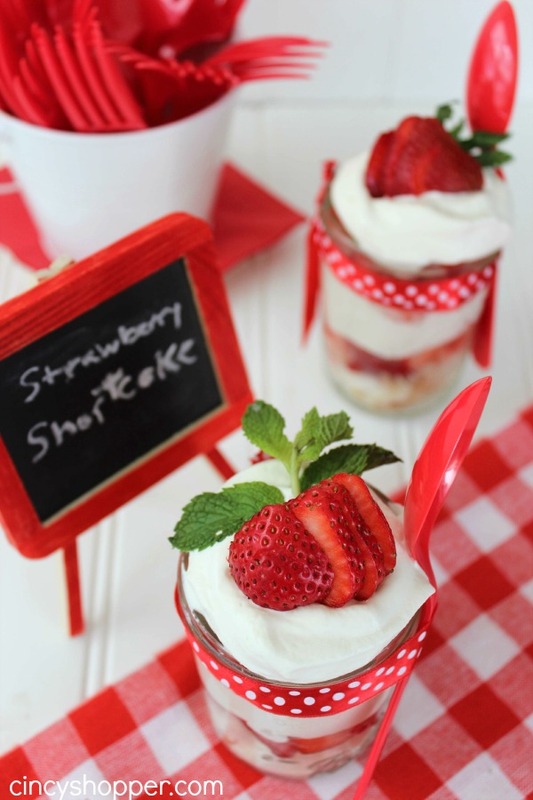 I think this Strawberry Shortcake in a Jar Recipe is going to be perfect for our Fourth of July dessert table. If you are looking for some desserts be sure to see all of my dessert recipes here. 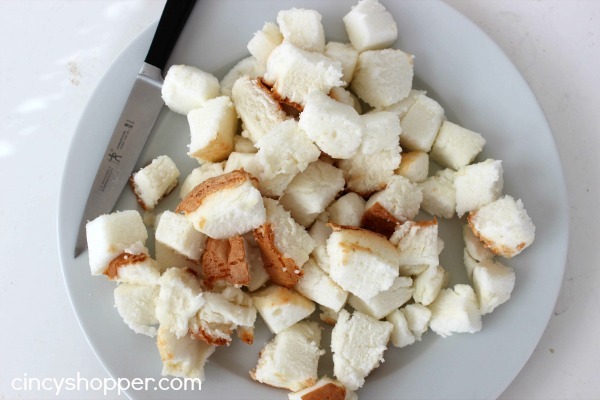 Cut cake into 1" cubes. Combine heavy cream powdered sugar and vanilla. Whip until stiff peaks form. In each jar layer cake then strawberries, then whip cream and then repeat these layers.